Goa offers so much diversity when it comes to food. Goa is not just about shacks, King’s beer and beautiful beaches, but there’s so much that we end up exploring every time we visit Goa. Our last exploration in Goa let us to discover the 10+ different varieties of pao. Apart from the international cuisine that Goa welcomes with its open arms, they also have their own unique style of food. Goa’s local food is influenced by the Portuguese and Saraswat Hindu and you see local flavors like coconut, vinegar, kokum, wine. Piri Piri – small chilies also play an important role in spicing things up. 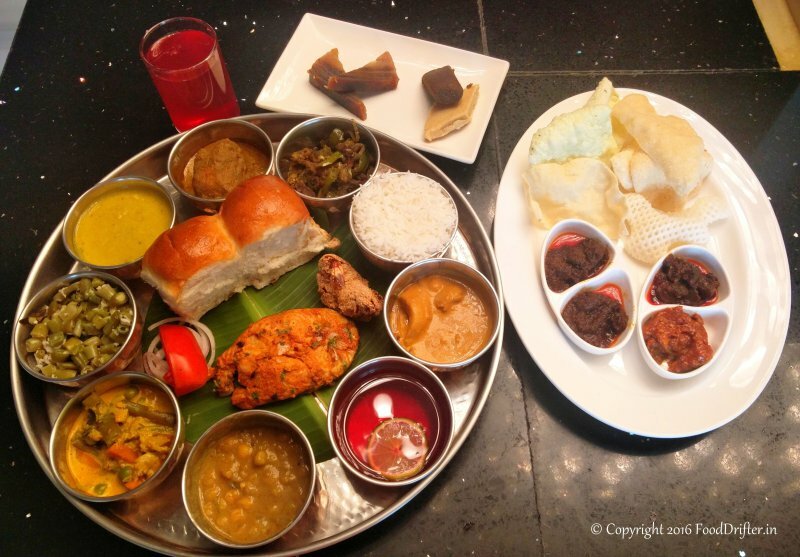 Hyderabad as such doesn’t have a standalone restaurant for Goan cuisine and opportunities to savor the Goan flavors locally are quite less too. So it was quite exciting to have Chef Anthony D’Souza from Vivanta by Taj – Panaji here to showcase the best of his Goan cuisine right here at Taj Vivanta – Begumpet. We started our Goan food journey with Bolinas de batata – veg potato balls with gooey cheese filling. This vegetarian Goan dish was a pleasant delight. Diners around popped up as many 6-7 of these as soon as these arrived on the table. You should definitely not miss these at the festival. I then moved on to try the different meats at the live station. Chicken Jere Mere on Skewer, King fish peri peri. Coupled with beer, these can definitely take you back on the beaches of Goa. Spices along with ginger-garlic, vinegar and chilliest form the base of the marination for these meat and were definitely fresh and delicious. Prawns ravas fry with a Kokum drink served alongside was another one of my favorite among the starters that was perfectly coated and deep fried. For main course, a quick walk along the counters and I picked up my all time favorite – Chicken Xacuti and pao. Now anyone who has visited Goa would have tried this dish which is most famous among the Goan curries. A coarse brown curry with a base of ginger-garlic, onion, chilies and coconut goes well with hot rice, pao and in fact any meat that you can lay your hands on. One bite and the flavors reminded me of how much I had missed this dish and I had to go back to Goa soon. But I was happy with the flavor right here in Hyderabad. I moved on to the next few favorites Goan Fish Curry and Beef Chilly Fry. While the quintessential Goan favorite King’s beer was definitely missed again, hot rice paired with the curry was perfect. Goan fish curry was less spicy but the Beef Chilly Fry was perfectly done. I usually don’t eat vegetarian food but looking at the Hindu Goan influenced dishes by the chef, decided to move on to featuring dishes like Varan Bhaat – rice and dal served along with mix veg mardol, bean foogath which is dry preparation with coconut and beans and channacho ross which was subtle coconut curry. These dishes were definitely less spicy than their Portugues-inspired dish counterparts and the veggies brought out the freshness of the coconut and the kokum that it was cooked with. Moving on to the desserts, decided to have a bite of Bebinca, the multi-layered Goan dessert. Featuring on the dessert menu was also the Doce, a chickpea and coconut sweet.